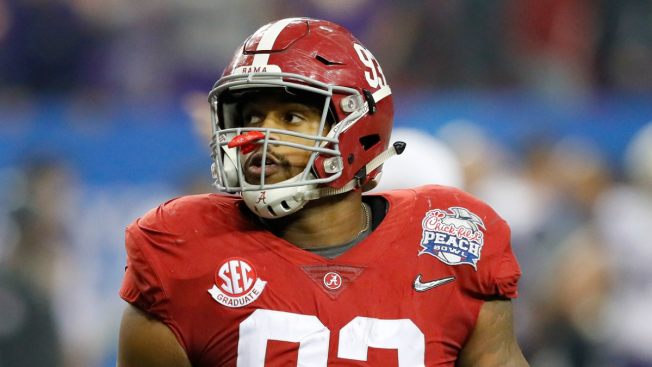 Jonathan Allen #93 of the Alabama Crimson Tide looks onduring the 2016 Chick-fil-A Peach Bowl at the Georgia Dome on December 31, 2016 in Atlanta, Georgia. With the third overall pick in this year’s NFL Draft, the Chicago Bears have plenty of options to explore as they look to improve their team, but they got some potentially bad news about one of the players that could be on their radar. That player is University of Alabama defensive end Jonathan Allen, who has been projected by many outlets to go to the Bears with the third pick. .Allen, who was a key cog in the 2016 National Champions, is widely seen as a top-five pick, but a shoulder issue could give teams some pause as the NFL Draft approaches. Allen had surgery on both shoulders during his collegiate career, with labral tears causing some concerns during his time with the Crimson Tide. After those procedures, Allen has mild arthritis in both shoulders, and it could potentially be an issue that could dog him throughout his career. Despite those questions, Alabama team doctor Lyle Cain insists that Allen is completely healthy and that teams who may have concerns needn’t worry. Allen certainly has had a decorated career, with a national title in 2015 and a Bronko Nagurski Trophy from his fantastic 2016 season. He’ll be participating in this week’s NFL Scouting Combine in Indianapolis, and he’ll be doing workouts like bench press to show that his shoulders are up to the task of an NFL career. “This is something that a lot of offensive linemen and defensive linemen have, things guys play with their whole careers,” Cain said.